12/22/18 - Added new 2019 wide screen calendars. 12/25/17 - Added new 2018 wide screen calendars. 01/01/17 - Added new 2017 wide screen calendars. 03/27/16 - Added new TAS comic "A Taste of the Arrow" by Jon Markiewitz to the comics page. 01/02/16 - Added new 2016 calendars. Now in wide screen. 10/23/15 - Added new images to the art page. 10/18/15 - Added new TAS comic "Upon the Outward World" by Jon Markiewitz to the comics page. 6/02/15 - Added new fan art to the art page. 5/31/15 - Added new starship pictures to the Art page. 5/28/15 - Added new Aquashuttle wallpaper to "The Ambergris Element" page. 5/22/15 - Added new Aquashuttle wallpaper to "The Ambergris Element" page. 5/17/15 - Remade Enterprise picture page with all new screen caps. 5/12/15 - Added new wallpaper to the Enterprise pcture page. 5/10/15 - Added new wallpaper to the Enterprise pcture page. 5/9/15 - Added new TAS comic "Eyes of New Harvest" by Jon Markiewitz to the comics page. 5/9/15 - Added Orion Starship wallpaper to the Pirates of Orion episode page. 5/3/15 - Added new cargo ship wallpaper to "More Tribbles, More Troubles" episode page. 4-30-15 - Added beam in animation to page 3 of the comic "Heads of the Hydrae". 3-20-15 - Added two Orion Starship wallpapers to the Pirates of Orion episode page. 2-8-15 - Added starship wallpaper to Enterprise pictures page. 01-25-15 - Added two starship images to the Time Trap episode page. 01-24-15 - Added seven images of fan made freighters to the Pirates of Orion episode page. 01-03-15 - New TAS calendars for 2015! 12-16-14 - Added new TAS comic "Perils of Waves and War" by Jon Markiewitz to the comics page. 11-01-14 - Added Youtube video to the Portraits page. 10-01-14 - Updated Main Page. 09-23-14 - Created the Mr. Spock photo gallery. 09-17-14 - Created the Captain Kirk photo gallery. 09-05-14 - Page 33, the final page, of the TAS comic "Better Safe Than Sauria". 09-01-14 - Added 5 new images to the Coloring Book. 07-06-14 - Updated "The Time Trap" episode page. Added wallpaper by Darrell Lawrence. 06-07-14 - Updated Main Page. 03-15-14 - Updated Main Page. 01-04-14 - Check out the new Star Trek: TAS Comics playing cards! 12-26-13 - New 2014 TAS calendars. 9-8-13 - Debuted week #1 of the TAS comic strip "Better Safe Than Sauria". 5-12-13 - Reformatted TAS comic #3 "Tigers of Heaven". 4-21-13 - Reformatted TAS comic #2 "Nature To Eternity". 4-10-13 - Reformatted TAS comic #4 "To Dance With the Devil". 3-28-13 - Reformatted TAS comic #6 "Home is Not a Placee". 3-5-13 - Reformatted TAS comic #5 "The Heads of the Hydrae". 2-4-13 - Reformatted TAS comic #7 "Like Father, Like Son". 1-6-13 - Reformatted TAS comic #8 "The Patient Parasites". 12-26-12 - New 2013 TAS calendars. 11-02-12 - Uploaded Final Page of the TAS comic strip "Murder on Tuesday". 1-07-12 - New 2012 TAS calendars. 7-10-11 - Uploaded cover and page one of the new TAS Comic strip, "Murder On Tuesday". 4-24-11 - Added a Beatles birthday party invitation to the Beatles greeting cards page. 2-8-11 - Added four new wallpapers to the Beatles cartoon page. 1-01-11 - New 2011 TAS calendars. 11-28-10 - New Beyond The Farthest Star wallpaer. 11-28-10 - Added link to lost TAS PSA spot onto the Main page. 11/11/10 - Added two new wallpapers to the Beatles cartoon page. 10/31/10 - Added three new wallpapers to the Beatles cartoon page. 10/10/10 - Added four new widescreen wallpapers to the Beatles cartoon page. 9/22/10 - Added new Paul McCartney image to The Yellow Submarine wallpaper page. 9/21/10 - Added new George Harrison image to The Yellow Submarine wallpaper page. 9/18/10 - Added Youtube links to the Starship Farragut The Animated Episodes page. 6/26/10 - Updated websites footer in compliance with a request from CBS. 02/20/10 - Uploaded new fan art from J.L. Anderson onto the TAS art page. 02/20/10 - Uploaded Cargo Ship Blueprints by Roger Gilbertson to the "More Tribbles, More Troubles" episode page. 01/24/10 - Uploaded new TAS Comic book, "Dearly Departed", featuring the crew of the Starship Farragut. 12/29/09 - Uploaded new TAS calendars for 2010. 10/03/09 - Updated portraits page. 06/27/09 - Updated the TAS cast portrait page. 12/27/08 - Uploaded new TAS calendars for 2009. 10/13/08 - Removed all audio and film clips from my episode pages at the request of CBS legal department. 04/17/08 - Added Starship Farragut: The animated episodes page here. 12/08/07 - Uploaded new TAS calendars for 2008. 10/10/07 - Uploaded all new DVD screencaps to the "Counter-Clock Incident" episode page. 10/08/07 - Uploaded all new DVD screencaps to the "How Sharper Than A Serpents Tooth" episode page. 10/07/07 - Uploaded all new DVD screencaps to the "Albatross" episode page. 10/06/07 - Uploaded all new DVD screencaps to the "The Practical Joker" episode page. 10/04/07 - Uploaded all new DVD screencaps to the "Bem" episode page. 10/03/07 - Uploaded all new DVD screencaps to "The Pirates of Orion" episode page. 09/30/07 - Uploaded all new DVD screencaps to "The Jihad" episode page. 09/28/07 - Uploaded all new DVD screencaps to "The Eye of the Beholder" episode page. 09/27/07 - Uploaded all new DVD screencaps to "The Slaver Weapon" episode page. 09/25/07 - Uploaded all new DVD screencaps to "The Ambergris Element" episode page. 09/24/07 - Uploaded all new DVD screencaps to "The Time Trap" episode page. 09/23/07 - Uploaded all new DVD screencaps to the "Terratin Incident" episode page. 09/22/07 - Uploaded all new DVD screencaps to the "Mudd's Passion" episode page. 09/21/07 - Uploaded all new DVD screencaps to the "Once Upon a Planet" episode page. 09/20/07 - Uploaded all new DVD screencaps to the "The Magicks of Megas-Tu" episode page. 09/19/07 - Uploaded all new DVD screencaps to the "Infinite Vulcan" episode page. 09/15/07 - Uploaded all new DVD screencaps to the "The Survivor" episode page. 09/14/07 - Uploaded all new DVD screencaps to the "More Tribbles, More Troubles" episode page. 09/12/07 - Uploaded all new DVD screencaps to the "The Lorelei Signal" episode page. 09/11/07 - Uploaded all new DVD screencaps to the "One of our Planets is Missing" episode page. 09/10/07 - Uploaded all new DVD screencaps to the "Yesteryear" episode page. 09/09/07 - Uploaded all new DVD screen captures to the "Beyond The Farthest Star" episode page. 12/22/06 - New 2007 TAS calendar. 10/04/06 - Added "Star Trek meets The Andy Griffith show" to the art page. 09/18/06 - Added two new pieces of fan art to the art page by John Ridley. 09/07/06 - Added two new pieces of fan art to the art page. 07/19/06 - Added a note about the Animated Star Trek series release on DVD to the Main Page. 03/17/06 - New TAS comic book "The Patient Parasites". Written by Russell Bates, author of the Animated Star Trek episode "How Sharper Than a Serpents Tooth". 12/31/05 - New TAS Calendars for 2006! 07/17/05 - New TAS comic book "Like Father, Like Son". 06/19/05 - Finished doing maintenance on all episode pages. 02/09/05 - Added a new art gallery dedicated to a TrekBBS art contest to design a new animated Star Trek series. 02/01/05 - Added five new coloring book images. Created the Star Trek Maze Page. 01/08/05 - Updated portrait page. 12/27/04 - Updated Enterprise picture page. 12/25/04 - Uploaded new 2005 calendars. 08/22/04 - Added three new Enterprise wallpapers to the "For Death or Glory" comic page. 08/15/04 - New TAS comic book! "For Death or Glory" By Colin Moore. 07/26/04 - Added new fan art by the Bertonator. 05/23/04 - Remade the comic "Nature To Eternity" with all new art work. 03/26/04 - New TAS comic book! "Home is Not a Place" Featuring the crew of the "Starship Exeter". 02/07/04 - Added all new screen caps to the episode "Ambergris Element". 01/24/04 - Remade the TAS comic "Tigers of Heaven" using CG images for all space/ship shots. 01/04/04 - Repaired all broken links in games section. 01/04/04 - New 2004 TAS calendars. 11/15/03 - Updated The Survivor episode page, and added great fan art of Carter Winstons ship. 10/22/03 - New TAS comic book! "The Heads of the Hydrae"
9/21/03 - Added new pictures to aliens page, and new M'Ress fan art to art page. 9/21/03 - Thanks to TrekPulse for their award! 9/21/03 - Repaired all links to discussion and greeting card pages, all 660 of them!! 7/27/03 - Added new picture of Captain Kirk to the cast picture page. 7/18/03 - Created a lower resolution version of the "To Dance With the Devil" comic in one .zip file for people with slower internet connections. 7/15/03 - Created new gallery of "To Dance With the Devil" wallpapers featuring the CGI art work of Raul Quiles JR.
7/13/03 - New TAS comic book, "To Dance With The Devil". 6/07/03 - Added new M'Ress art to the art page. 6/01/03 - Added a page devoted to the Beatles Saturday morning cartoon show. 5/10/03 - Put episode list in air date order. 4/28/03 - Added new page dedicated to the Rittenhouse TAS trading cards. 4/27/03 - Reorganized coloring book page. 4/27/03 - Added four new coloring book images to coloring page. 4/27/03 - Added two pieces of Michael Rogers art to the art page. 4/20/03 - Added new Sulu picture to the cast picture page. 4/15/03 - Announced winner of the TAS VCD give-away on the "Tigers of Heaven" page. 4/13/03 - New Captain April art work to art page. 3/30/03 - Added new Captain April cartoon Romulan bird of Prey images to the art page. 3/23/03 - All new TAS comic book "Tigers of Heaven". 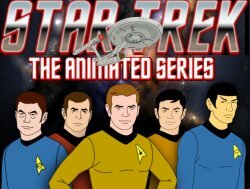 Win the entire animated Star Trek series on VCD! 03/17/03 - Added cartoon like CGI images to the art page. 02/16/03 - New Uhuracoloring page. 02/15/03 - Five new coloring pages. 01/19/03 - Two new fan art images. Two new digital remakes to the equipment page. Six new remakes to the ship picture page. 01/17/03 - Six new coloring book images. 01/01/03 - Fixed links to my colorization of Mad magazines Star Trek parody on the art page. 12/24/02 - Created all new calendars for 2003. 12/21/02 - New modified pictures of Scotty in the transporter room to equipment page, and Spock at his bridge station to the ship picture page. 12/21/02 - Added new digitally enhanced conference room picture to the ship picture page, and to the coloring book page. 12/19/02 - Added picture of the bridge to my coloring book page. 12/12/02 - Added three pictures of my digitally enhanced transporter room to the equipment page. Also added a coloring book image of the transporter room. 12/08/02 - Three "Nature to Eternity" wallpapers added to comic book page. Added a new page, "The Battle of Devron" to the "Nature to Eternity" comic. Page 15a. Four new TAS stationary and note pads. Created four to a sheet note pads for some of the older TAS stationary. 12/02/02 - Two images of Chekov as he might have appeared on TAS added to cast picture page. 12/02/02 - New original TAS comic book! 12/01/02 - New fan art, TNG TAS promo poster. 12/01/02 - Two new coloring book images. 10/30/02 - New Spock remake added to cast picture page, and coloring book. 10/27/02 - New Spock remake added to Cast picture page. 10/27/02 - Two new coloring book images. Scotty and Spock. 10/22/02 - New remake of Scotty added to cast picture page. 10/20/02 - New remake of Dr. McCoy added to cast picture page. 10/17/02 - New digital Kirk remake added to cast page. 10/10/02 - Four new coloring book images. 10/05/02 - Five new coloring book images. 10/05/02 - Exclusive David Gerrold TAS interview. 10/03/02 - Added Sursnake to the coloring book page. 10/03/02 - Added new digital remake of the Sursnake to the alien picture page. 09/09/02 - Added 3 new pieces of fan art to art page. 09/08/02 - Created new, original, animation for the "Time Trap" episode page. 08/26/02 - New 3 view Bonaventure wallpaper added to Thomas7g and Timetrap pages. 08/25/02 - Added new cast picture to Cast page. Added new stationary of Lt. M'Ress to second stationary page. 08/17/02 - Added several new digital remakes to the cast picture page. Added new remake of the main view screen to the equipment picture page. 06/28/02 - Updated Thomas7g 3D art work page. 06/27/02 - Posted new USS Enterprise art work to art page, and coloring book page. 06/23/02 - Added new 3D Sherman class tug to More Troubles More Tribbles page. 06/23/02 - Added new Kirk image to cast pictures page, and Coloring book page. 06/16/02 - Updated Time Trap and Thomas7G pages with 3 new USS Bonaventure wallpapers. 05/17/02 - Added TAS desktop Icons to the Downloadables page. 05/06/02 - Added digital remake of the second rock monster to the alien picture page. 05/05/02 - Added 8 new images of the crew and others to the coloring page. Added digitally retouched portraits of the TAS crew to the Cast Pictures page. 01/13/02 - Added more of my own TAS art, plus a great 3D M'ress and others to the art page. Added new schematics, 3D model, general plans, and Merchant marine emblem/badge for the USS Huron to the Pirates of Orion page. Added schematic of USS Bonaventure to The Time Trap episode page. 01/04/02 - Complete year 2002 TAS calendars. 25 new TAS stationary and notepads. New art section. Many new images suitable for wallpapers or framing. 12/04/01 - New Feb 2002 calendar. 11/29/01 - Began new TAS contest give-away!! 11/18/01 - January 2002 calendar. 10/14/01 - Remade Stone Trek tribute page over. 10/13/01 - December 2001 calendar. 09/28/01 - Added two great pieces from the Captain to the art page. 09/25/01 - Began new TAS contest! 09/10/01 - Young Spock (Vulcan child) remake added to alien picture page. 09/09/01 - New Kukulkan remake added to alien picture page. 09/08/01 - November 2001 Kailendar featuring Kukulkan. 08/29/01 - Created William "Billy" Simpson (The voice of Young Spock) interview page. 08/20/01 - New Vendorian remake added to the Aliens picture page. 08/04/01 - Oct. 2001 Kailendar. 07/22/01 - Sept. 2001 Kailendar featuring a Dramian added. 06/11/01 - New August 2001 Kailendar. 05/30/01 - Began new TAS contest! 05/06/01 - Added images of the Aquan and the Vendalan to the coloring book page. 05/06/01 - Added new enhanced image of an Vendalan to the aliens page. 05/04/01 - Added July 2001 Kailendar. 05/01/01 - Added new enhanced image of an Aquan to the aliens page. 04/29/01 - Created new coloring book page. 04/29/01 - Added new enhanced image of an aborigine to the aliens page. 04/29/01 - New featured episode, Bem. 04/04/01 - Added June 2001 Kailendar. 03/04/01 - Added new enhanced images of the La-matya, and a Dramian to the Aliens picture page. 03/04/01 - Added May 2001 Kailendar featuring a re mastered capture of a Kzinti. 03/04/01 - New featured episode, Once Upon a Planet. 01/30/01 - Restored TAS Screen savers to downloads page. 01/29/01 - New featured episode, "The Counter-Clock Incident". 01/27/01 - Added April 2001 Kailendar featuring M'ress. 01/21/01 - Uploaded new enhanced images of Agmar, Kzinti, and Bem to aliens picture page. 01/20/01 - Added a TAS themed jigsaw puzzle to the games section. 01/19/01 - Added new digitally enhanced Mress, Arex, and Vendorian images to Aliens picture page. 01/19/01 - Added March Kailendar featuring Arex. 01/13/01 - Moved site to new Hispeed server. 12/13/00 - New sick bay stationary. 12/13/00 - Fantastic new Feb. 2000 Kailendar featuring Vendorian art work by Connie Long. 12/12/00 - New featured episode "One of our Planets is Missing"
12/12/00 - Added Captain Mikes art work "Deep Space Nine:The Animated Series" to the art page. 11/28/00 - New Jan. 2001 Kailendar. 11/11/00 - New featured episode "Albatross". 10/07/00 - New featured episode "The Terratin Incident". 10/06/00 - Added two new images to the art page. M'Ress, and Commander Tr'revak. 10/05/00 - New December 2000 Kailendar. 09/09/00 - New featured episode "How Sharper Than a Serpents Tooth". Including a TAS exclusive, a letter from the author himself, Russel Bates. 09/09/00 - Added Larry Brodys comments about writing "The Magicks of Megas-Tu", and meeting Gene Roddenberry. 08/31/00 - Added TAS crossword puzzle from '73 Star Trek Animated Fan Club newsletter. 08/30/00 - Added TAS Word Hunt from '73 Star Trek Animated Fan Club newsletter. 08/29/00 - New November 2000 Kailendar. 08/17/00 - Added new engineering stationary. 08/13/00 - Created Pirates of Orion stationary. 08/11/00 - New Oct. Kailendar. 08/10/00 - Updated featured episode. New featured episode, The Pirates of Orion. 08/06/00 - Began contest to win complete set of Alan Dean Fosters TAS books. 07/30/00 - Added interview with TAS Special FX artist Corry Kingsbury. 07/15/00 - Updated featured episode. New featured episode, The Practical Joker. 06/28/00 - New Sept. Kailendar. 06/20/00 - New Stationary featuring the Enterprise bridge. 06/14/00 - Added M'Ress and Arex' Biographies to the '73 TAS Fan Club Newsletter page. 06/13/00 - Updated featured episode. New featured episode, More Tribbles, More Trouble. 06/09/00 - Added new Enterprise screen saver to Downloadables page. 06/05/00 - Added 3 more of my production cels to the Memorabilia page. Kirk, Spock, and Scotty. 05/14/00 - Updated featured episode. New featured ep "The Infinite Vulcan". 05/10/00 - Added links to Sunday Funnies on all Featured Episode pages. 04/29/00 - Added Dax's art work to art page. 04/25/00 - Created Memorabilia page. 04/10/00 - Updated featured episode. New featured ep "The Eye of the Beholder". 03/09/00 - Created new TAS aliens screen saver. explains how an episode is created in the original '73 TAS newsletter. 03/04/00 - Four new animated greeting cards. 03/02/00 - Updated featured episode, "The Jihad"
02/29/00 - Added April 2000 calendar, and new Jihad stationary. 02/06/00 - Added 2 production cels to art page. 02/05/00 - Added 33 new wav files to sounds page. 02/05/00 - Created new Mress and transporter room dancing greeting cards. 02/04/00 - Added Thomas' new CGI image of the Enterprise and cargo ship orbiting station K7 to art page. 01/23/00 - New featured episode, "Mudd's Passion"
01/09/00 - Added Feb. 2000 calendar to Kailendars in Multifarious. 01/05/00 - Created TAS fan club newsletter page in Multifarious section. Interview with Gene Roddenberry. 01/04/00 - New featured episode, "Beyond the Farthest Star". Updated with all new captures. 12/31/99 - Uploaded Jan. 2000 calendarr, and the Yesteryear story board to the Multifarious section. Added TAS screen saver to downloadable page. 11/24/99 - New featured episode, "Yesteryear". Now with all new captures. 11/21/99 - Added new TAS slider puzzle to game section. 10/25/99 - Added links to STONE TREK. 10/24/99 - Updated Kailendar section of Multifarious, Nov. and Dec. Added new images to Art page. 10/23/99 - New featured episode, "The Magicks of Megas-Tu". 10/10/99 - Added downloadables page to Multifarious section containing 3 TAS ICQ skins. 9/23/99 - Updated 2 new calendars to Multifarious section. 9/20/99 - New featured episode, "The Time Trap." 9/18/99 - Added 2 new notepads to stationary in Multifarious section. 9/14/99 - Added Klingon ship pan to Multifarious picture page. 9/09/99 - Uploaded all new multifarious pictures. 8/22/99 - Updated Multifarious section, added Sept. calendar, and Lorelei note pad. 8/21/99 - Updated featured episode page. New episode, "The Lorelei Signal"
8/14/99 - Added new pics to art page. 7/20/99 - Uploaded all new pics to second Aliens picture page. 7/18/99 - Updated featured episode page. New episode, "The Survivor". Added new wavs to sound page. 7/17/99 - Uploaded all new pics to page one of alien pictures page. 7/15/99 - Added TAS Breakout to game section. 7/13/99 - Completed replacing all pictures on The Enterprise page. 7/09/99 - Added new panoramic picture of Main engineering to the Equipment page. 7/08/99 - Completed replacing all the pictures on the Equipment page. 6/26/99 - Uploaded new cast picture page with larger, clearer, screen captures. 6/25/99 - Added Vendorian pic to art and greeting card pages. 6/22/99 - Added Vendorian note pad to Stationary page in Multifarious. 6/20/99 - Updated Kailendars in Multifarious section. 6/19/99 - Put new animated gifs on Art page. 6/18/99 - Updated the featured episode page. New featured episode, "The Slaver Weapon". 6/13/99 - Added 3 new sounds to sound page. 6/12/99 - Put new animated gifs on the Yesteryear and Sounds pages. "This website is not endorsed, sponsored or affiliated with CBS Studios Inc. or the "Star Trek" franchise. The STAR TREK trademarks and logos are owned by CBS Studios Inc."